Blackstone - long-term consultancy and design with supply of plants. The owner of this beautiful country house by Lutyens instructed Lovely, Lovely, Lovely to create a long-term development plan, divided into manageable phases of work. In each phase, we worked closely with the client to create the effects required, at a rate chosen by the client. 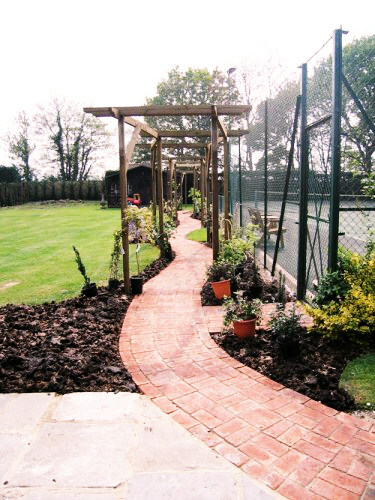 In Phase 1, we tackled the wasted area in front of the tennis court: this formed one side of the main house forecourt and so needed to be both welcoming and in keeping with the formality of the house, whilst concealing the tennis courts beyond. We proposed a trellis, hand-made to match elements of the house itself, and a private and pretty secret garden including seating in the fillet of land in between. The planting was finely detailed to create an attractive and discreet seating area, which effectively screened the tennis courts. In Phase 2, our recommendation to re-site the swimming pool allowed the scheme to be extended to wrap around the long-side of the tennis courts, creating more secluded and beautiful garden space, which also allows spectators to enjoy the tennis. 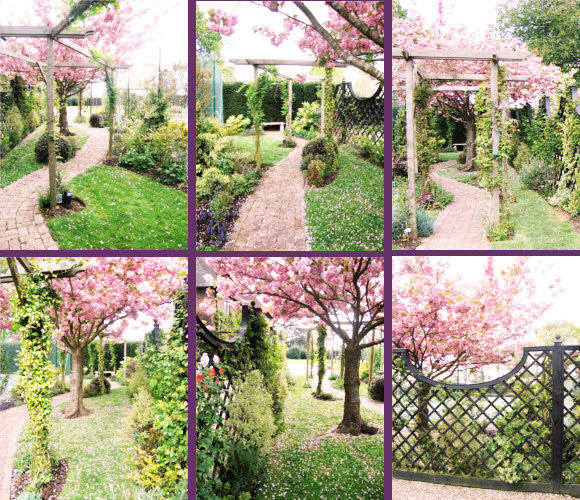 In each phase, Lovely, Lovely, Lovely produced a sketch design which was priced, then built by a landscaper. 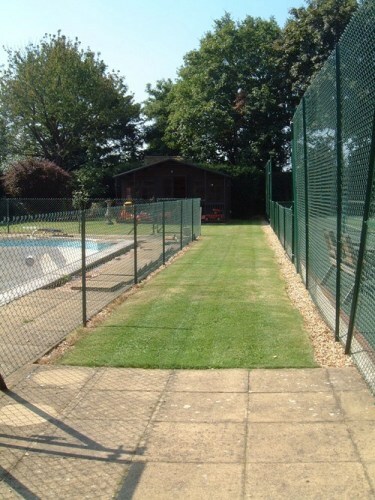 In this case, at the client’s request, we recommended a landscaper known by us to produce excellent work. Lovely, Lovely, Lovely specified all plants. At the client’s request, we then went on to supply the plants, using our network of high-quality and good value nurseries. Lovely, Lovely, Lovely is never rigid in approach. The degree of detail at any stage is completely dependent on what the client needs to make a decision – some will need a full planting plan (see Design & Project Management) whilst others may prefer a sketch and an estimated price. Phase 1 - finished garden, pergola, winding basket-weave brick path and the enclosing ornamental trellis. 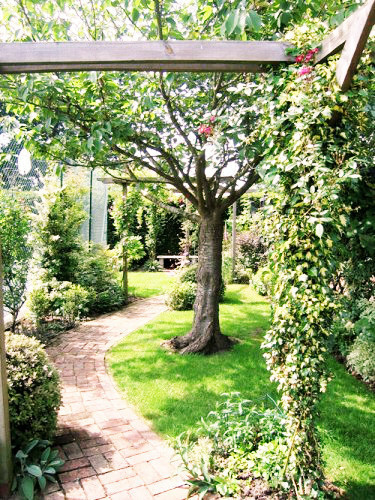 The secret garden is now a special space; lush and quiet, private and pretty, yet smart and architectural - essential qualities in such a prominent position. It remains beautiful all year round. Lovely, Lovely, Lovely’s expertise in plant selection is particularly evident here. Turning into the main house courtyard the visitor was confronted by this bleak view of an old cherry tree, sitting lonely and exposed in tired soil. 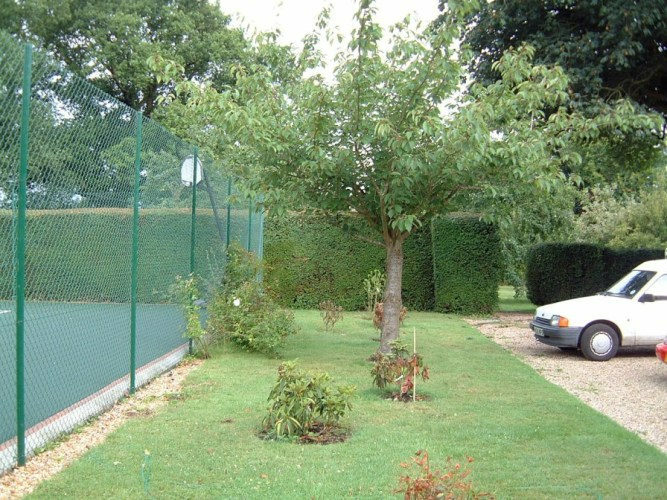 We listened carefully to the wishes of our client, then translated them into a practical design, which retained the flowering cherry tree and the tennis court’s wire fence. We sketched ideas rapidly on site to stimulate a productive dialogue with our client. This proved enough for the client to approve our developing a priced scheme. 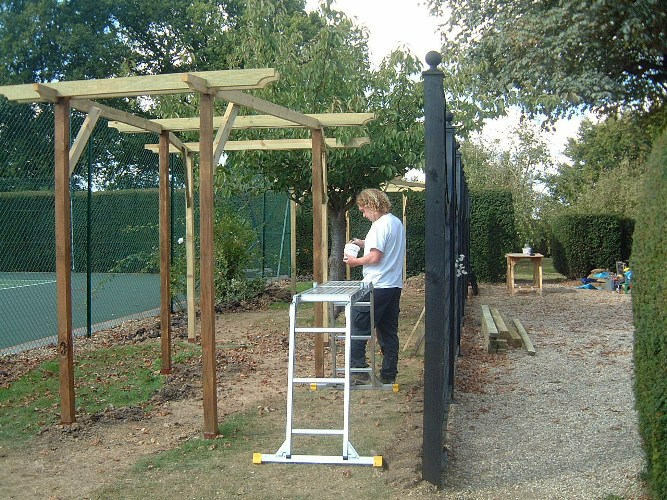 Here the pergola and screen are being erected. These structural elements mean the view will remain strong and visually attractive all year round. They also will serve to steer the eye away from the tennis courts beyond. We were on hand throughout the construction period to smooth the process from sketch to finished construction. 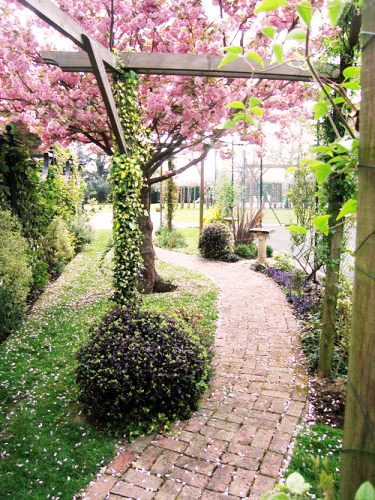 The scheme retains the old flowering cherry, using it to its full advantage to enhance the view from the house and for visitors to the secret garden. 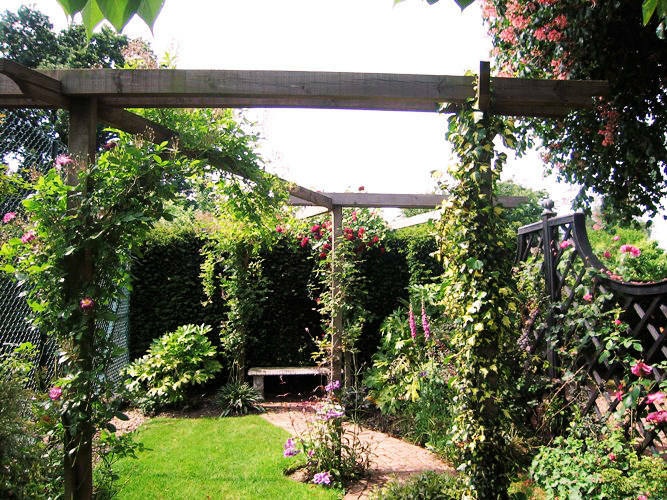 Visually, it becomes the main structural upright in the garden, and helps to make the small space seem much more expansive. 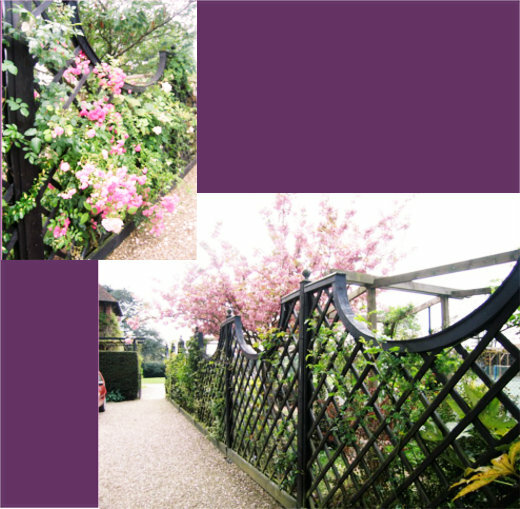 The forecourt is now beautifully dressed by this elegant trellis, specially hand-made by one of our contractors to our design. The soft plants dressing the structure screen the garden beyond but allow tantalising glimpses of the space beyond. The carefully-chosen plants add colour all year round. We are on call to administer any advice or physical help to the planting or landscaping to keep this looking at its best. Every possible viewpoint is considered in the design to make this garden a beautiful place to see and to use. Most schemes of this size will require regular maintenance, which we can provide or upon which we can advise. The seating area at the end of the garden now provides a peace not found in the previously exposed parkland setting. We carefully orchestrated the growth of the scheme to achieve the desired effects as early as possible. A closer view of the charming seating area. 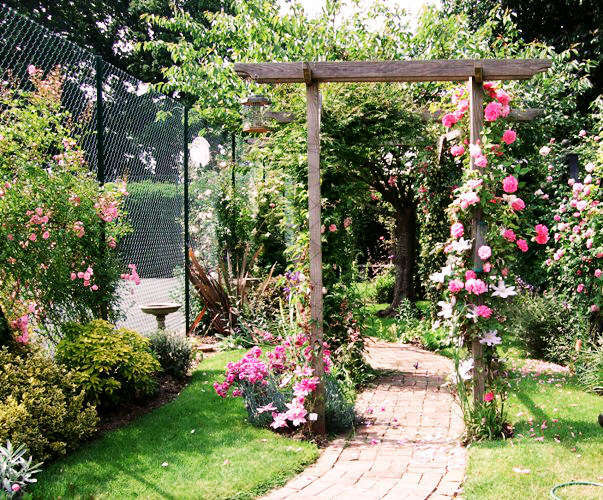 The careful planting gives colour and structure as it softens the wooden pergola and screen, and as the scheme matures the plants embrace the tennis court keep-netting, adding to the privacy of the garden. 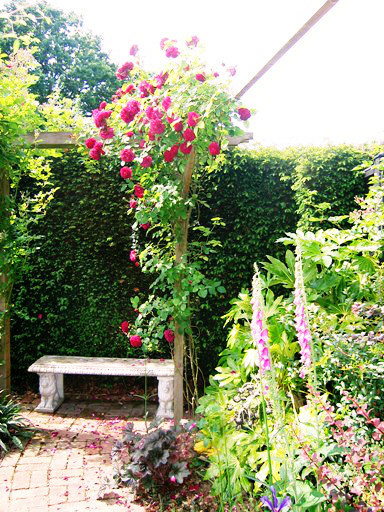 This client retains a skilled and excellent gardener, who maintains the scheme, so we need visit only occasionally to offer advice on care or minor enhancements to the planting. The long vista of the tennis court - bare, unadorned and somewhat depressing! The client's delight at the early results of Phase 1 led to a decision to take the scheme further with Lovely, Lovely, Lovely. 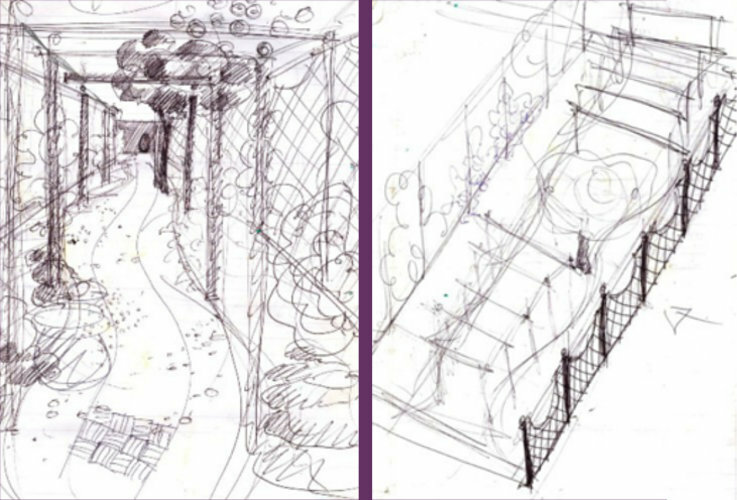 A key part of our role was, by way of exploratory sketches and discussion, to help the client to determine the positioning of major elements in the entire garden - vital decisions with long-term consequences. Once the decision was reached to move the pool to a better position, Phase 2 could begin in earnest. This photo shows the scheme to dress the long side of the courts during planting. Very soon, the growing plants will transform this long vista. Lovely, Lovely, Lovely designed the layout and specified the plants, later going on to supply them and set them out in readiness for planting. In this case, the client’s gardener dug the new beds to our layout, lavishly manuring them to ensure optimum progress for the new plants, and then planted them. In other cases, Lovely, Lovely, Lovely is happy to provide this service. 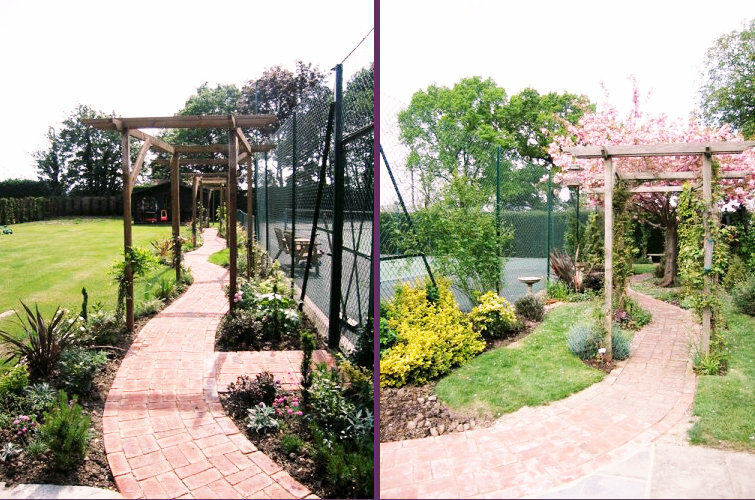 In Phase 2, particular care was taken to create sheltered areas where spectators can watch the tennis or simply enjoy a picnic, whilst being wrapped in flowers. As this juxtaposition shows, we worked closely with the client’s chosen landscapers to ensure that the two phases join seamlessly. The result is immediate softening of the formerly harsh and jarring views of the tennis court, and a garden that will provide increasing beauty and seclusion as the scheme matures.